What did I do this weekend? Not much. Watched some TV, napped a little. I would have read something, but I am currently out of books (anyone have any recommendations?) Oh, and I made bread. Brioche, actually. This was my second attempt at making brioche. The first attempt almost lead me to tears of frustration, but Janice’s recent bread success inspired me to try again. I am so glad I did. This time I used Bon Appétit’s Golden Brioche recipe. I was careful to follow each step exactly as written. I was strangely fascinated watching the butter incorporate into the dough, and at one point could even smell the butter as the mixer worked its magic. Once all the mixing and kneading was done, I waited impatiently for the dough to rise. Then I had the satisfaction of punching it down so it could rise all over. This was followed by the tough part: chilling overnight. Sunday morning I woke up separated the dough into three equal parts. One part became a loaf, another buns, and the third will get a post all its own soon. I was hoping the loaf would rise a little more, but I am very pleased with the result. It’s wonderful with a little cream cheese and raspberry jam. Bon Appétit’s instructions are very thorough, so rather than rewriting the recipe in my own words and missing some important step, I’ll just direct you to their recipe. I will say that the rolls were done in about 15 minutes, as the recipe only provides baking times for the loaves. Oh, nothing beats good brioche! Great post! it looks like they came out really well…I have not tried brioche for the same reason, fear of failure…lol….but you have given me hope!! What a beautiful picture with that bright red jam on delicious bread. 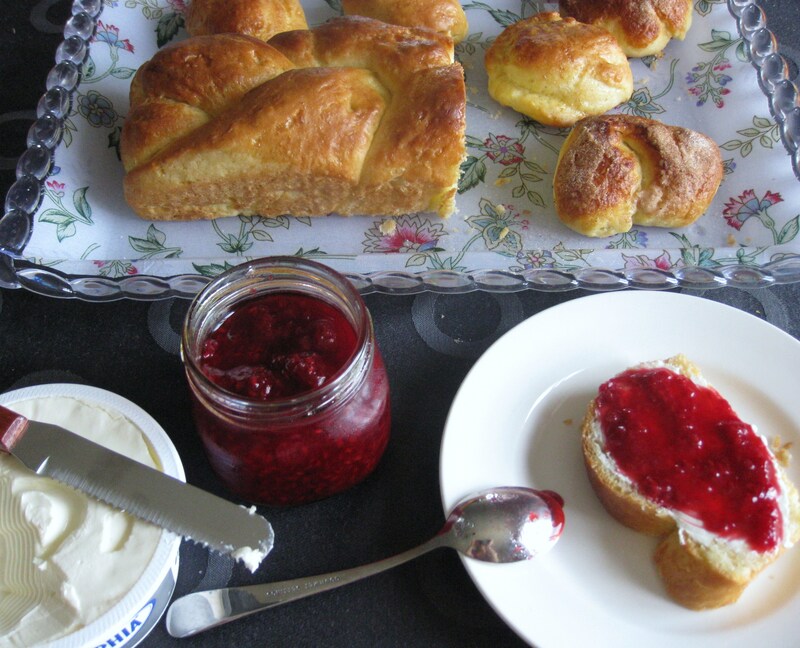 Brioche is on my list of things to try. Thant looks lovely and inspiring. Have you read Jodi Picoult books? She’s one of my current faves. I haven’t but I’ll give her a try! Thanks for the tip! Looks absolutely delicious! I’ve never mad brioche. One of these days. I love this recipe! Just perfect. Ah I have never attempted brioche, but I have definitely eaten more than my share… kudos to you for mastering this beautiful recipe!